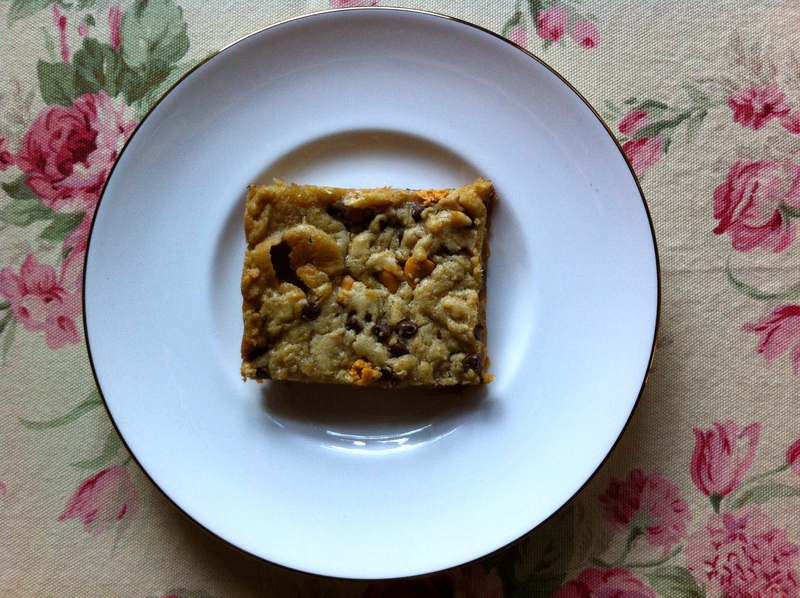 Easy, Adaptable Blondies – Voila! These blondies are exactly what the title says they are: easy to make and adaptable. I added 1/2 cup toasted walnuts and 1/2 cup dark chocolate chips. Next time they might be just plain or topped with M&Ms or mixed with dried cranberries. Seriously, these really are infinitely versatile. They also happen to be one of James’ favorite desserts so how could I pass up the chance to try this recipe?! That’s what makes cooking so fun — trying new recipes, being flexible and satisfying other people (of course I take part in the eating, too)! 1. Mix melted butter with brown sugar – beat until smooth. Beat in egg and then vanilla. 2. Add salt, stir in flour. Mix in any additions (below). 3. Pour into prepared pan. Bake for 20-25 minutes, or until set in the middle. A note from Smitten Kitchen: I always err on the side of caution with baking times — nobody ever complained about a gooey-middled cookie. Cool on rack before cutting them.